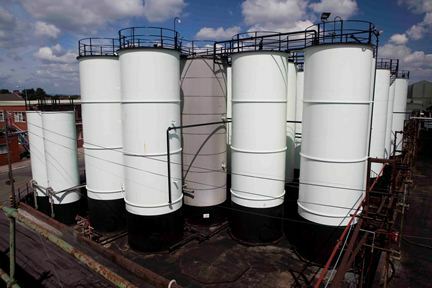 Huge volumes of oily wastewater effluents processed at the UK’s largest hazardous waste treatment facility are now yielding commercial quantities of reusable oil which would once have been incinerated. Waste managers Cleansing Service Group, which runs the 30-acre award-winning facility at Cadishead, Salford, collects and processes thousands of tons of oily water wastes each year. Much of it is delivered to Cadishead by the company’s fleet of specialist tankers following the emptying of interceptors and drainage systems at garage forecourts throughout the UK. More is sourced from oil refineries, chemical plants, engineering plants, accidental spills and material collected during site remediation clearances after contamination. Some of the oil is recovered after separation processes using gravity, centrifuge and thermal desorption technologies, but large amounts of the waste have not been suitable for these processes and have been disposed of by incineration. “Our aim is to be totally self-sufficient in all areas of oil recovery from the liquid wastes we manage and we’ve always recognised that incineration was not an environmentally ideal method of disposal. And, of course, valuable resources were being lost,” said Cadishead site manager Jen Cartmell. The task of boosting oil recovery rates at Cadishead was handed to the company’s research and development team which recommended the use of a steam-generation boiler to heat up oily water mixtures which won’t separate by gravity alone. Following solids separation in a centrifuge, the mixtures are heated to around 75oC to reduce the density of the oil, allowing it to free itself more easily from the denser water and solids and separate out as a distinct layer. The process, which has Environment Agency approval, is now in full operation and is producing around 40 tons of reusable oil from every 100 ton tank of effluent. CSG say the recovered oil is of a higher quality, contains significantly less water and solids and is ready to be sent to a specialist oil reprocessing company where it can be prepared for use as a recovered fuel oil in industrial boilers.